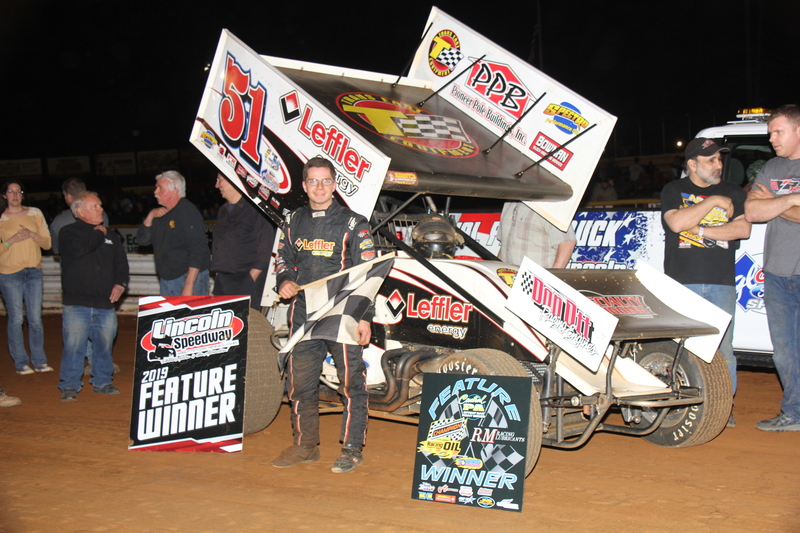 Abbottstown, PA (March 30, 2019) – Freddie Rahmer got the monkey off his back Saturday night at Lincoln Speedway, with his first win of the 2019 season. Joe Kata started on the pole with Cole Young on the outside of row 1. Glenndon Forsythe and Tyler Esh made up row two. Kata got a good start and had the lead with Forsythe up to second when the caution came out on lap 1. Esh got sideways in turn 1 and collected Jim Siegel. Todd Gracey, who was running his 360 Sprint Car, pulled into the pits under the caution ending his night. Both Esh and Siegel pulled in parallel to their pit stalls indicating they wanted to utilize the two-minute work period. Siegel ended up pulling into his pit as there was too much damage to the No. 59. Esh was able to rejoin the field. Rahmer was up to 4th from his 6th starting spot on the restart. Last week’s feature winner, Alan Krimes, started 9th and had made his way to 6th for the restart. After the restart, Rahmer made his way up to 3rd on lap 2. Kyle Moody started working his way through the field from his 12th starting spot and was up to 9th in two laps. Kata started to pull away from the field as Rahmer made his way up to second on lap 4. Kata had a lead of over 2 seconds by lap 6. Rahmer started to close the gap to Kata as they approached lapped traffic on lap 8. Rahmer had Kata’s lead down to .6 seconds and got under Kata in turns 3 and 4 on lap 11 but couldn’t complete the pass. Freddie stuck around and got by Joe for the lead coming out of turn 2 on the next lap. It didn’t take long for Rahmer to pull away from the rest of the field. It took Freddie one lap to put 2 seconds between him and second place. The second caution of the race came on lap 15 for Brian Montieth and Brett Michalski in turn 4. Montieth had been running 5th and had made it a 4-car battle for second with Kata, Forsythe and Adam Wilt. Both Montieth and Michalski were able to rejoin the field. The restart with 10 laps to go erased Rahmer’s lead of 2.7 seconds over the field. Rahmer got a great start at the cone. Lap 17 saw a lot of action as Wilt got around Forsythe for third and Moody had worked his way up to seventh. As Wilt caught Kata a great battle for second ensued. While the battle for second was heating up, the battle for fourth, between Forsythe and Tim Glatfelter was just as exciting. Wilt got around Kata for second on lap 22. Forsythe and Glatfelter were right there to make it a three-way battel for 3rd with Kata. Glatfelter eventually came out of the pack with third place with two laps to go. Rahmer got to the checkered flag first for the win with Wilt crossing the line second. Glatfelter held onto third. Moody made his way up to fourth and Forsythe held onto fifth. Two drivers traveled to the track to compete on Saturday. Cody Bova made the trip from Struthers, Ohio and Plano, Texas driver, T.J. Michael also joined the competition. 410 Sprint Car heat winners were Jim Siegel, Cole Young and Glenndon Forsythe. After a DNF in last week’s feature, Jeff Halligan turned it around and ended the night in Victory Lane. Halligan started on the pole of Saturday Night’s feature with Ashley Cappetta sharing the front row. CJ Tracy and Tyler Walton made up row 2. Halligan got out to the lead at the start with Chris Frank getting up to second from his fifth starting spot. The caution came out before a lap was completed for Kyle Denmyer who spun out in turns 1 and 2. Denmyer was able to rejoin the field. Jeff got another good start on the complete restart. Cappetta held onto second with Walton third. Kevin Nouse got up to fourth from his seventh starting spot. Cappetta and Walton drag raced down the back stretch for second on lap 2 with Walton taking the position from Cappetta. The caution came out again on lap 3. This time it was for Mike Bittinger and Cody Fletcher in turn 3. Bittinger was on his side and nearly flipped his car but in an impressive act he was able to drive away from the incident. After the remarkable move, Bittinger pulled into the pits and was done for the night. Fletcher rejoined the field. Walton stayed with Halligan on the restart after they passed the cone. Nouse was all over Cappetta for third and got under her in turns 1 and 2 for the spot but the caution came out. Last week’s winner, Troy Wagaman Jr., found himself in need of a tow back to the pits from the front stretch. Halligan went to the top of turns 1 and 2 on the restart with Walton trying the bottom. Halligan held off Walton and kept the lead. Nouse was working on Cappetta for third while Tyler Ross made his way up to fifth. David Holbrook spun out in turn 2 to bring out the caution on lap 8. Holbrook rejoined the field. Nouse got under Cappetta on the restart in turn 1 but Ashley got the spot back coming out of turn 2. The caution flag came out on lap 10 for Zach Euculano as he came to a stop along the inside guardrail in turn 3. Halligan had a good start and but some distance between Walton. Nouse was not able to get a good run on Cappetta on the restart. Jeff started to pull away from the rest of the field and had a 1.7 second lead on lap 13 when the caution came out for Holbrook who spun out in turns 3 and 4. Holbrook rejoined the field. The caution flag came out for the final time on the ensuing restart for Frank when he came to a stop in turns 1 and 2. Ross got his nose under Nouse for fourth but couldn’t make it stick. Halligan garnered a nearly 2 second lead with 4 laps to go and never looked back. Walton held onto second with Cappetta crossing the line third. Nouse finished fourth with Ross completing the top five. 358 Sprint heats were won by Ashley Cappetta, Kevin Nouse and Todd Rittenhouse. Next Saturday, April 6, Lincoln Speedway is back in action with 410 & 358 Sprint Cars and Wingless Super Sportsman. Racing starts at 7PM with pit gates opening at 4:30PM and grandstand gates opening at 5PM.